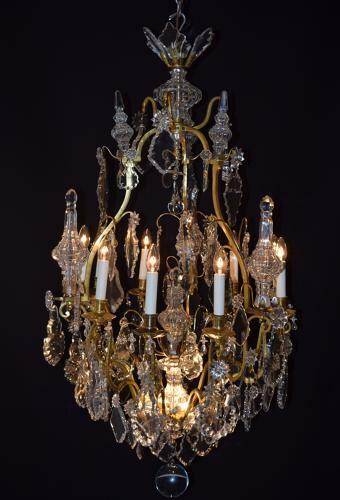 A large 10 light gilt bronze chandelier with very high quality crystal glass finials, stem pieces and plaques of varying shapes and sizes, the largest being 17cm long. Three of the finials at 30 cm high. The centre internally lit with G9 miniature bulbs below a solid Baccarat style block plinth stem with outswept spray and large drops centred by a large finial of 26cm high. The overall height is 1m, 30 with large original ball.